Historically, universities have been society’s fundamental means of generating, preserving, and disseminating knowledge. The role of the library, the classroom, and the campus itself is being radically redefined in an age of online lectures, intelligent textbooks, active learning classrooms and collaborative research and learning. Institutions are increasingly enmeshed in a global web of partnerships for everything from purchasing to research and publishing, from courses and learning objects to credentialing and student services. As government support struggles to keep pace with rising costs, campus IT has to cope with a whirlwind of new demands and expectations on a limited budget. 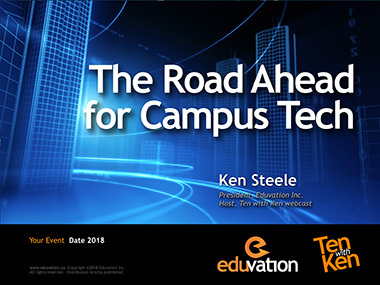 Ken Steele is Canada’s leading higher education monitor and futurist. He co-founded Academica Group, created the Academica Top Ten, manages Eduvation Inc, co-authored Canada’s first book on enrolment management, and hosts a weekly webcast, Ten with Ken, that reaches thousands of subscribers on a dozen platforms. Ken brings his unique perspective and insight to a broad range of audiences, from faculty and instructors, boards and senior administration, to information technology staff, concerned parents, and Canada’s most powerful corporate CEOs.